The Alder and Willow Flycatchers look so similar that they were once thought to be the same species called Traill's Flycatcher. The Alder's harsh, burry fee-bee-oo song is the only reliable way to identify this species in the field. The Alder Flycatcher only breeds in far northeastern Tennessee, but since it rarely sings away from the breeding grounds, little is known about this species during migration in the state. The breeding range is more northern and boreal than the Willow's, and extends across Alaska and Canada, to the northeastern United States and southward in the Appalachian Mountains. The winter range is in northern South America and not well known. Description: This small flycatcher is dull olive above, light gray below, has a white throat, and a whitish belly washed in yellow. It has two whitish wing-bars, an indistinct eyering, and a short, wide bill that is dark above and pale yellow or pinkish below. Both male and female look the same. Voice: The song is a harsh, burry fee-bee-oo. All Empidonax flycatchers look similar, and the Willow Flycatcher has identical plumage to the Alder Flycatcher in the field. All these species are most easily identified by voice. Habitat: In the southern Appalachian Mountains, Alder Flycatchers are found in dense, scrubby, deciduous thickets in both upland, and slightly boggy settings, mostly above 4,800 feet elevation. Nesting and reproduction: The Alder Flycatcher is the last species to arrive on their breeding grounds in Tennessee, arriving in mid-May. Clutch Size: 3 to 4 eggs. Incubation: The female incubates the eggs for 12 to 14 days. Fledging: Both adults feed the young, which fledge in about 14 days. Nest: The Alder Flycatcher's nest is a coarse, loose cup that nearly always has material hanging off it. The female builds the nest and usually places it low in a bush. Status in Tennessee: The Alder Flycatcher breeds only in far northeastern Tennessee, arriving in mid-May and departing in August. Since this species rarely sings away from the breeding grounds, little is known about this species in Tennessee during migration. 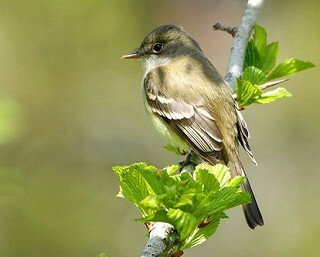 The Alder Flycatcher is so similar in appearance to the Willow Flycatcher that they were thought to be the same species, called the Traill's Flycatcher, until 1973. Their song is the only definitive way to tell them apart in the field. They are still called Traill's Flycatcher when seen and identity is uncertain. The Alder Flycatcher has only recently extended its breeding range into the southern Appalachian Mountains. It was first recorded during the breeding season on Roan Mountain in 1977, and the first successful nesting was documented in 1978. In a research experiment, nestling Alder Flycatchers were exposed only to the songs of the closely related Willow Flycatcher. The next spring, these flycatchers were able to sing normal Alder Flycatcher songs. Best places to see in Tennessee: The most consistent breeding location is on the crest of Roan Mountain. Also recorded on Big Bald Mountain, Hampton Creek Cove SNA, and on The Nature Conservancy land in Shady Valley. Lowther, P.E. 1999. Alder Flycatcher (Empidonax alnorum), The Birds of North America (A. Poole and F. Gill, eds.). The Academy of Natural Sciences, Philadelphia, PA, and The American Ornithologists' Union, Washington, D.C.